Cowgirl outfits are popular with little buckaroos in training, and they're surprisingly easy to find. 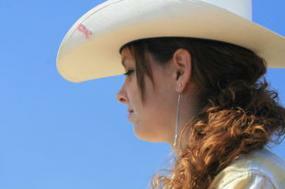 Cowgirls have a reputation for being feminine and tough. They are able to tame the land and animals while riding the range on the back of a horse. With their heroic athleticism, legendary lassos and cute clothes, it's no wonder why so many youngsters try to emulate female roughriders. As a result of cowgirls' growing popularity, many children's clothing companies have created Western Wear collections, designed specifically for future cowpokes. There is a difference between cowgirl costumes and cowgirl outfits. Cowgirl costumes are typically found in specialty stores and tend to be more ostentatious and include whimsical touches such as embroidered logos and rhinestone-studded designs. In addition, cowgirl costumes rely heavily on coordinating pieces that don't mix-and-match well outside the set, such as all-pink leather skirts, vests, and boots. Conversely, Western-themed cowgirl outfits usually come with pieces that coordinate with other items in your daughter's closet. Cowgirl outfits are easy to assemble. Purchase inexpensive vinyl boots and accessorize them with metallic gold tassels. Instead of purchasing an expensive custom-made Western shirt, buy a traditional button-down plaid shirt and tie the ends. Then, pair it with an existing vest or layer it over a white tank top. Embellish worn-out denim jeans with rhinestones, faux suede fringes or use fabric paint to add a Western-themed pattern. Add fringes to a denim skirt or dye your girl's skirt to match her boots. 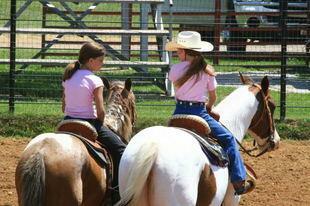 Look for used equestrian chaps at consignment stores, and then tailor them to fit your little cowgirl. Look around your house for leather belts with big metal buckles, and then alter them to fit your young wrangler. Pick up an affordable cowboy hat from a thrift store or discount retailer, then decorate it with string braids or jewels. Find an inexpensive denim jacket and personalize it with a Western design using fabric paint or colorful thread. Make a lasso out of a child's jump rope. Style your daughter's hair like a cowgirl's. Weave leather strips into her braids or simply make pigtails that fit securely under her cowgirl hat or a bandana. Accessorize with an inexpensive toy gun that you can buy at the Dollar Store. Whereas cowgirl clothes used to be categorized exclusively as specialty items in pageants or as Halloween costumes, these days they are used as everyday wear. This is true for girls of all ages from toddlers through teens. If your daughter wants to dress like a cowgirl the easiest way is to embellish existing clothing items. Add horse appliqués, star patches, or even silver or leather fringed trim to shirts and hemlines, and your little girl will be ready to ride the trails in style.